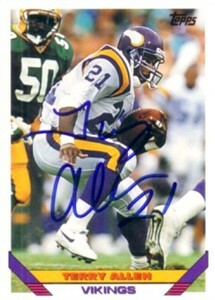 1993 Topps card autographed in blue marker by former Minnesota Vikings running back Terry Allen, who later starred for the Redskins. With certificate of authenticity from AutographsForSale.com. ONLY ONE OF THIS CARD AVAILABLE FOR SALE.